In an ever changing worldwide political environment, when the conversation comes to the bilateral relations between two states, diplomacy holds a key role for the maintenance of peace and freedom. 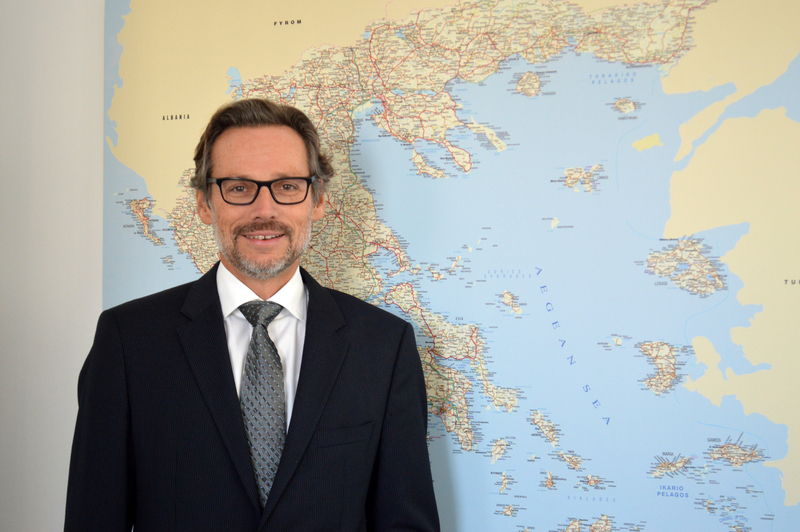 Jens Plötner, the Ambassador of Germany to Greece is challenged to promote meaningful dialogue between the two governments for the coming years. In the following frank talk he refers to the origins of the past problems between Germany and Greece, their relations today, the reunion process of refugee families as well as to Berlin’s view with respect to the recent recognition of Jerusalem as Israel’s capital by the US. Mr. Ambassador, since the beginning of the economic recession, there were times when Germany and Greece faced a number of serious challenges. To what extent were these problems real and to what extent were they overstated by the press and the politicians? There were real problems – but not between Greece and Germany. The problems were initially of global nature, as the burst of the US mortgage bubble triggered a financial crisis that spilled over to other parts of the world. They were then of European nature, because the EU at that time did not yet have the institutions and instruments to tackle the subsequent challenges. And finally, they were of domestic nature in some EU member states, among them Greece, where the global crisis lay bare structural economic and fiscal weaknesses. I am convinced that as a consequence of these events we have found good instruments to strengthen not only the European institutional framework but also the resilience of member states through ambitious reform agendas. However, in the process of addressing these problems in Greece, differences between some European countries and subsequent Greek governments were often inaccurately reduced to a German-Greek opposition. This was done by media, but also by politicians in both countries. The exchange of dumb stereotypes was appalling – and I am very happy that this episode now lies behind us! How would you rate the relations between the two countries today? I would call it a matured family-relationship. The relationship between our two countries has always had certain aspects of a roller-coaster ride: From very high to very low moments. King Otto of Bavaria helped lay the foundations of the modern Greek nation state – but he was a foreign ruler imposed from outside. The German occupation during the World War II was definitely an all-time-low, bringing untold suffering to so many people here in Greece. But then starting at the end of the 50s, Germany became a destination for many Greeks looking for a better life, in the late 60s to 70s for freedom from military rule. Today, after the last crisis in our relations, I think we know each other quite well – our strengths, our weaknesses. Like in a family, we have had hard times, but deep inside we know we belong together – bound by geography, shared history and common European values. How does Germany foresee the evolution of Europe within the coming decade and what is the role Germany wants to have? Our future lies in Europe! This is a strong belief shared by the overwhelming majority of political parties and citizens in my country. If we want to keep our European-way-of-life – democracy, pluralism, rule-of-law and the respect of individual freedom – then Europe must stand together, united and strong. But “united” does not mean uniform – we are different in many ways, but this diversity can and should be our strength. Building this kind of Europe is the great challenge we face, and the coming year will be particularly important. What role will Germany play: As a country in the middle of Europe, bordering nine countries, we live up to its responsibility while always being mindful of going along with the biggest possible number of European partners. Mr. Ambassador, the refugee crisis over the last few years forced many families to split from each other. Refugee family reunion is officially supported by Berlin. What is the current situation about this issue? The refugee crisis has left many European countries confronted with huge challenges – politically and logistically. While we want to reunite families, at the same time we must be mindful of doing so in an organized way, putting at their disposal the appropriate reception facilities. I am very glad that we were able to significantly raise the number of cases of family reunification from Greece to Germany the last month. Only in November, more than 500 family members where transferred to Germany! Additionally, we have secured funding to give German language courses to family members in Greece. This will allow them to use the waiting-time in a useful manner and to integrate more quickly once they arrive in Germany. After Donald Trump’s recognition of Jerusalem as Israel’s capital, how do concerns that conditions could worsen in the Middle East as a whole, echo to you? The recognition of Jerusalem as Israel’s capital is a decision the European Union does not consider helpful or positive. We are convinced that a just and lasting peace in the Middle East can only be the result of negotiations between Israel and the Palestinians. And it is well known that Jerusalem – a city to which both Jews and Muslims have very strong ties – is one of the most delicate issues in such a negotiation. I hope that we can find the way back to serious talks about a two-state-solution. What is your aspiration regarding the relations between Germany and Greece during your tenure here in Greece and why not after it? Building on the strong ties which exist between our two peoples and countries, I would like to broaden the scope and further intensify the fields of cooperation. Science, youth exchange, Greek investments in Germany and German ones in Greece, cooperation between our start-up sectors, between our trade unions, in the fields of culture and creative industries. And I would like to see our countries cooperate even more in shaping the European Union of tomorrow. Jens was born in Eutin, Germany in 1967. He studied law and political science in Hamburg, Bordeaux and Paris. His diplomatic career started in 1998 at the German Embassy to Israel in Tel Aviv and the coming years he became Spokesperson at the Federal Foreign Office. From 2009-2012 he was Ambassador to Sri Lanka and from 2012-2013 to Tunisia. Just before he took up his duties as an Ambassador of Germany to Greece in July 2017, he served from 2014-2017 as the Head of Political Staff to then Foreign Minister and now President of Germany Frank-Walter Steinmeier.